Well what a week it has been, last Tuesday the vet came and microchipped all the foals. This went reasonably easily, a couple put up a bit of resistance at having headcollars put on but all in all quite a stress free task. Then the fun part of going through all the passport applications getting vet to sign and put barcodes on, making sure we didn't get them mixed up ! Foals all went back into the yard as if nothing had happened and then Thursday they started to leave us, first we took Lola (The Pye) to Anne in Surrey, then Luna (Worzel) to Gemma, near Dover. Up early on Friday as transporter coming to take Luigi (Prince Charming) to Manchester to Vicky, he arrived at 6.30 am good job he had lights in lorry ! After a long trip Jo and Carl arrived from Cornwall to take Lancelot and Lumiere to their new home, very strange going from 10 foals to 5 in 2 days. On Saturday Claire came from Cambridgeshire to pick up Leonardo (Top Gun), and then we delivered Louie to another Claire at Hartlip. We found out in the week that Lulus new owner could unfortunately no longer have her, so I put her back up for sale, within a day she had been bought as a Christmas present for Carole, and on Sunday they picked her up. So now we are down to just 2, Liberty who is waiting to go to Scotland and LaKaisha who we haven't sold yet. She is the original ugly duckling, should grow into a beautiful big girl but at the moment is very out of proportion and neither one colour or another, but watch this space is all I say lol. The biggest surprise of the week was finding our blagdon mare Mia had gven birth to a filly foal, we were pretty sure she was in foal but as she had got so fat over the summer was a job to tell how close she was, this foal is by Prince so should be quite big. This is nearly the end of another year of babies, what will next year bring. Going to be a bit of a mixed bag as not sure how fertile old King is now, at nearly 40 I think he probably should retire but if he can manage to cover a few then will let him carry on. We decided to bring him in and put our young stallion Shoey out. Some of the mares that didn't foal this year have been turned away with our little hairy Thomas, it will be very interesting to see what appears. 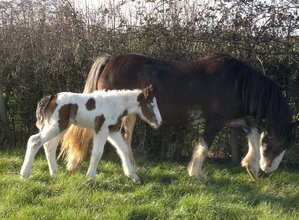 We have 22 mares so am hoping for more than 10 foals, time will tell and nature will take its course.